The i.MX25 multimedia applications processor has the right mix of high performance, low power, and integration to support the growing needs of the industrial and general embedded markets. At the core of the i.MX25 is Freescale’s fast, proven, power-efficient implementation of the ARM926EJ-S core, with speeds of up to 400 MHz. • Advanced power management—The heart of the device is a level of power management throughout the IC that enables the multimedia features and peripherals to achieve minimum system power consumption in active and various low-power modes. Power management techniques allow the designer to deliver a feature-rich product that requires levels of power far lower than typical industry expectations. • Multimedia powerhouse—The multimedia performance of the i.MX25 processor is boosted by a 16 KB L1 instruction and data cache system and further enhanced by an LCD controller (with alpha blending), a CMOS image sensor interface, an A/D controller (integrated touchscreen controller), and a programmable Smart DMA (SDMA) controller. • 128 Kbytes on-chip SRAM—The additional 128 Kbyte on-chip SRAM makes the device ideal for eliminating external RAM in applications with small footprint RTOS. The on-chip SRAM allows the designer to enable an ultra low power LCD refresh. • Interface flexibility—The device interface supports connection to all common types of external memories: MobileDDR, DDR, DDR2, NOR Flash, PSRAM, SDRAM and SRAM, NAND Flash, and managed NAND. • Increased security—Because the need for advanced security for tethered and untethered devices continues to increase, the i.MX25 processor delivers hardware-enabled security features that enable secure e-commerce, Digital Rights Management (DRM), information encryption, robust tamper detection, secure boot, and secure software downloads. • On-chip PHY—The device includes an HS USB OTG PHY and FS USB HOST PHY. • Fast Ethernet—For rapid external communication, a Fast Ethernet Controller (FEC) is included. • i.MX25 only supports Little Endian mode. The i.MX25 3-Stack Platform System helps you to develop multimedia communication applications using the i.MX25 ARM-9 CPU and the MC34704 power management chip. The 3-Stack consists of a CPU Engine board, a Personality board and a Debug board. 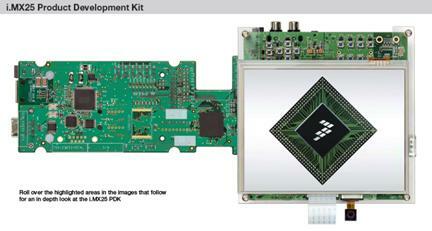 The system supports application software development, target board debugging, and optional circuit cards. The CPU board can be run in stand-alone mode for code development. A 5’7 LCD display panel is supplied with the 3-Stack. Near form-factor demonstration modules and working platforms. Solid reference schematics that closely resemble final products to aid customers’ designs. - Debug board with two RS232 interfaces, 10/100 Base-T Ethernet connector, and current measure connectors. Utilizes reliable high-density connector to interface between boards.